One of my favorite times of the year is the first few weeks of the fall semester. There is this incredible energy on grounds as students get back from their summer endeavors—whether they were working at an internship in D.C., or traveling around the Mediterranean on a Semester at Sea trip. Everyone is excited to reconnect on grounds, and go to a number of great welcome activities that take place in the weeks after move in. One of my favorite events is the hypnotist Tom Deluca, who performs in the amphitheater each year. Students go all out to be one of the lucky few who are picked to go on stage and get hypnotized by Deluca. Hopefuls will wear bright colors, and sit on the shoulders of their friends holding quirky signs. Over the years students have formed love affairs with pieces of fruit, football players have been convinced they were cheerleaders, and one student decided to change the school mascot to “the mayonnaise jars”. The activities fair is also a great event that takes place in the first few weeks of the semester. Every group you could imagine—from the Cavalier Daily (our student newspaper), to the Latino Student Union, to acapella groups, to the outdoors club—will be handing out information on what they do as a group, when meetings are, etc. It’s a great opportunity for new students to see what activities they might want to try out, and ultimately invest time in. Other annual events to take place this coming weekend are convocation—the official welcoming of the first year class by President Sullivan—as well as the Welcome Back concert at the John Paul Jones. This year’s line-up includes K’naan and Flosstradamus. Next week’s events include a movie showing on the Old Dorms quad, and the annual Rotunda Sing—an awesome event where students will set up blankets and picnics on the lawn, while watching all of our acapella groups perform. A warm welcome to the class of 2016! I look forward to spending this awesome time of the year with you all (and hopefully with all of you prospective students in the years to come). 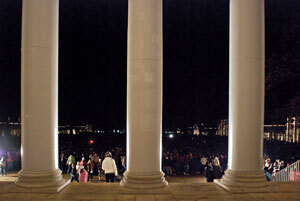 My favorite spot on grounds is the steps of the rotunda, after dark, right after lighting of the lawn, before we all leave for winter break. The marble is freezing and you can’t stay for too long, but the view is incredible. Seeing all the way toward Old Cabell hall, with the twinkling lights illuminating the pavilions down the lawn is a great reminder of everything I love about UVA; the beautiful landscape and rich tradition that is entwined in the culture of our school. Nothing is a better study break than a quick walk over from my coveted spot in the scholars lab of Alderman Library and taking in the view. When parents and prospective students ask me where my favorite “spot” on grounds is, they expect the grand: the steps of the Rotunda, a quiet bench in one of Jefferson’s individually designed gardens, lounging in the Amphitheatre or inside Clark library’s fantastic mural room. These are all beautiful places, characterized as “hot spots” of UVA. But, to be honest, my favorite spot is a chair. Tucked away in the back left corner, the blue leather seat a bit too saggy from excessive wear, sits “my chair” on the second floor of Alderman library in the MacGregor Room. Let me try to explain: every day I sit in this chair after I finish with classes, steaming cup of tea in hand, prepared to take on the endless pages a week I have to cram down as an English Major. This is a simple chair; perhaps its style is a bit outdated, but the dog-eared pages, newly formed creases in book bindings, and blue-ink underlines of passages are experiences that can only be created in this chair. I am prepared to be judged for how nerdy this may sound: this is my daily study ritual. I spend a lot of time in Nau and Gibson, two of the newer academic buildings at UVA that house the History and Politics departments. One of my favorite “spots” on grounds is the space that connects them—known as South Grounds Commons. It’s a two-story study area, with huge glass windows looking out at the complex’s courtyard, on one side, and the South Lawn, on the other. On a cold winter day, with the sun shining directly through those windows onto the tables and sofas, there is no better place to study. You can even conveniently fuel your caffeine addiction, with a Starbucks inside that accepts the UVA dining plan. Over the past two years, I have found three different places that I consider my favorites. The first I discovered was the McCormick Observatory. 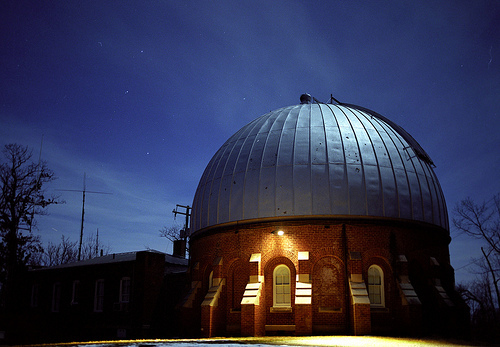 Every other Friday the Observatory is open for a public night, where UVA astronomy professors give an overview of astronomical observation and currently visible planets and stars. Even without a telescope, the view from the top of Observatory Hill is phenomenal. 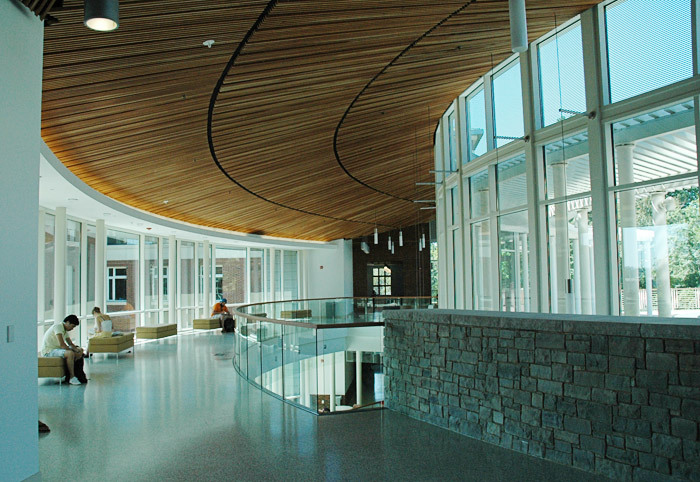 Academically, I enjoy Gibson and Nau halls, which holds UVA’s politics and religious studies departments. As a science person, it’s always an experience in Gibson/Nau; I’ve overheard conversations about the political status of most of the countries in the Middle East, the various orders of the angels, and the Bible’s influence on William Faulkner’s writings. Every time I study in Gibson/Nau, I indirectly learn a few tidbits just from my eavesdropping! Lastly, my favorite view on grounds is the gravel walkways connecting the Lawn’s gardens. The flowering trees create a tunnel over the path and ivy creeps over the brick walls from the gardens. It’s especially beautiful now, at the end of summer so enjoy it while the flowers are still there. All of these places are lovely, and I hope everyone can enjoy them as much as I do. When it comes to my favorite spots on grounds, I have to divide my favorite spots into social areas and study areas. When thinking of my favorite social spot, I have to say, I am pretty biased. One of my favorite parts of my week is going to University Singers with conductor Michael Slon. When 5:30pm comes, everyone in University Singers blasts out of the center doors of Old Cabell Hall headed to dinner, libraries, or events around grounds. Walking out of Old Cabell in the early evening, seeing the lawn, academical village, sunset, and the bustling student life, there is truly nothing like it. Another favorite spot of mine is the top floor of Rice Hall. Now, let it be widely known Rice Hall is the center for computer science engineering and my brain just doesn't work that way. But, that doesn't keep me from going into one of the newest and most innovative buildings on grounds. I love going to Rice Hall because there are great chairs, huge windows with spectacular views, and an added perk is that Rice is one of the most environmentally sustainable buildings on the east coast. There are so many great spots at UVa and I cannot wait to find more in the future. Hey guys my name is Phillip and I’m a rising 3rd year at UVA Majoring in Government and Minoring in Drama. 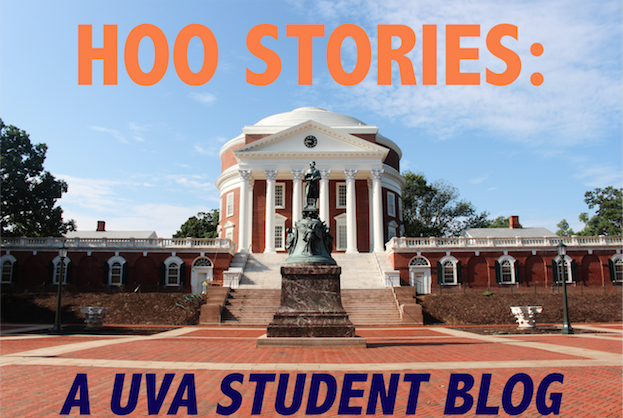 Since I’m minoring in Drama and the majority of my life outside of the classroom revolves around theatre, I’ve been asked to write a Blog Post about the Arts at UVA. This blog post is a long time coming. I was supposed to post it back in July or perhaps June, I don’t know. I must admit at first I was overwhelmed because there is so much to write about. Every time I began writing I didn’t know what to include or I felt like I was including too much. I believe the best way to talk about UVArts is through my first year experience. I’ve been doing musicals since the 4th grade. Upon entering UVA I knew I wanted to continue my passion. Unfortunately the UVA Drama Department conducts auditions the semester prior to the show’s official run. Therefore entering first years usually don’t have the opportunity to do theater in the Drama department their first semester. 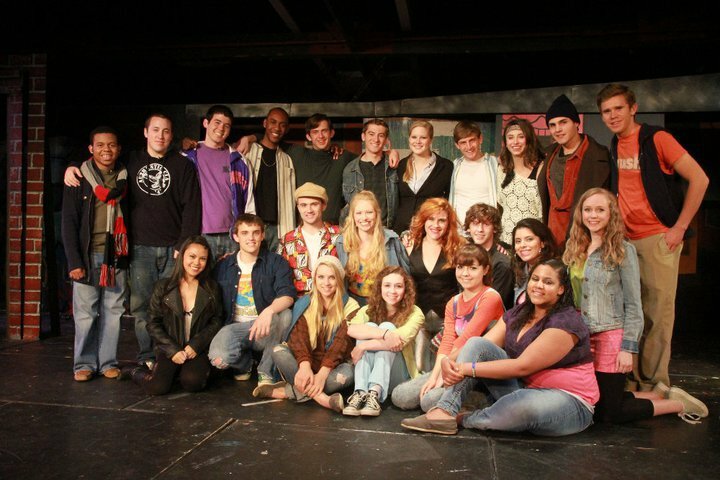 First Year Players (FYP) was created to help First Year students get their foot in the stage door of the arts. FYP is a musical theater organization lead by students for students. 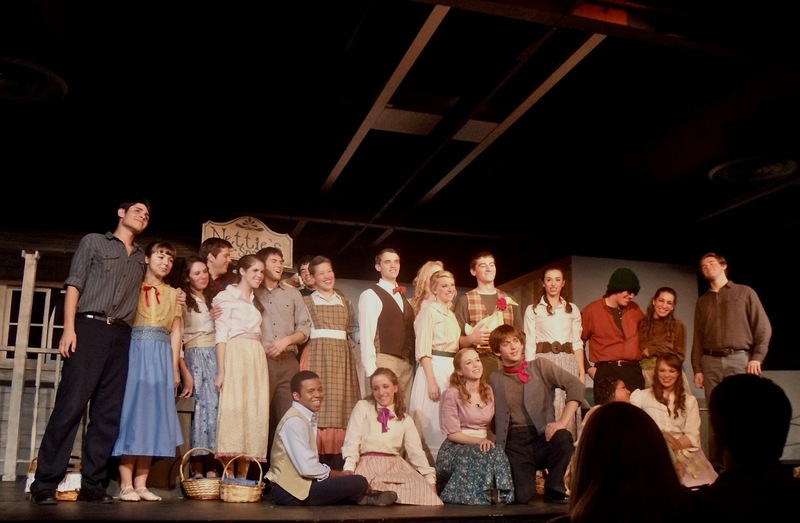 Each semester FYP mounts a new musical that is directed, choreographed, and musically directed by upperclassmen. The catch is only first years can be in the actually productions. First Year Players shaped my first year at UVA. 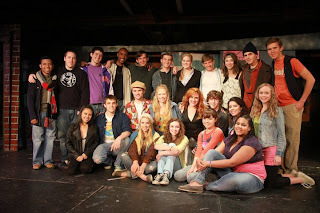 I was in two shows Carousel and RENT. Below are pictures of me with my two casts. Once your first year is over the fun doesn’t stop. You can be apart of FYP in a leadership role. Last semester I was Assistant Director for How To Succeed In Business Without Really Trying and that experience was just as rewarding as being in the cast. FYP creates an extensive network of friends that you can socialize with for four years. We party together, go to the beach together, camp together, and put on top-notch musicals together which solidifies our friendships.